Most of you caught the typo in the Texas Hold'em pattern. Sorry for the goof. The pattern has been corrected. Make sure the word HOLD'EM is spelled correctly and download it again if not. I think I need to hire a proof reader. I guess if Toyota can have a recall so can I. The pattern was corrected at 8:50 am eastern time April 8th 2010. Texas Hold'em has been one of the fastest growing card games in the last few years. I'm a hold'em fan myself. I watch the World Poker Tour and love to see pros and the amateurs compete. I'm not a gambler because I'm a tightwad but I could get hooked on hold'em if I was. 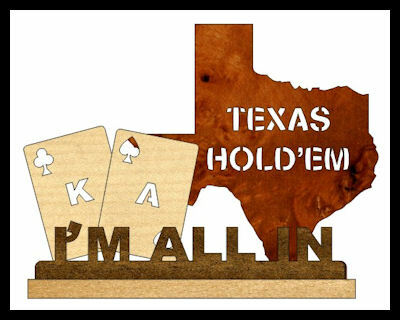 A reader asked for a Texas Hold'em pattern so here it is. I designed this one as a pen holder but you could make it a mini clock also. Thanks for the request. Don't forget to visit the blog and enter the giveaway. Look for the small scroll saw and click it to enter.